Investing in Broadband as Infrastructure | Strategic Networks Group, Inc.
We Don’t Have the Money – How Can We Afford Building-out Broadband? Establishing a broadband network in a locality with unserved or underserved areas is a significant undertaking and in some cases prohibitively costly. When there is not enough of a private sector business case to invest in an area, a pivot is needed to look at broadband as an investment for the long term – as infrastructure. In an area where there is not enough of a business case for the private sector to invest in broadband, planning and community engagement are necessary to avoid pitfalls and address the challenges listed above. Many network deployments have had challenges becoming sustainable because they have taken a build it and they will come approach. While people often initially focus on the network build, it is equally important to drive demand and build local capabilities to leverage technology. 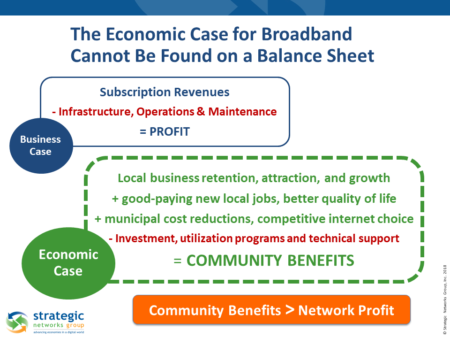 An economic case for investing in broadband is possible when local residents and businesses are connecting to and fully leveraging broadband to achieve long-term community-based goals. For this, localities need to understand how to impact broadband demand at a micro-level by personalizing the value of online practices to individual businesses, organizations and households. In addition to traditional sales and marketing efforts, increasing take rates and demand for higher value network services is needed to grow the business case for broadband investment. This requires community engagement, driving demand, and incentivizing implementation. At SNG we call this driving broadband utilization and community benefits. This is an essential element to building an economic case for investing in broadband. Pivoting to an economic case for investing in broadband (or a community return on investment) requires understanding the market potential for broadband. To understand how a locality can grow from broadband is market research based on data collection, empirical evidence, and objective analysis to assess whether the benefits from an investment in digital infrastructure outweigh the costs. This is needed to assess the economic case for investing in broadband, as well for building buy-in around common goals and counter objections that may be based on unfounded claims. 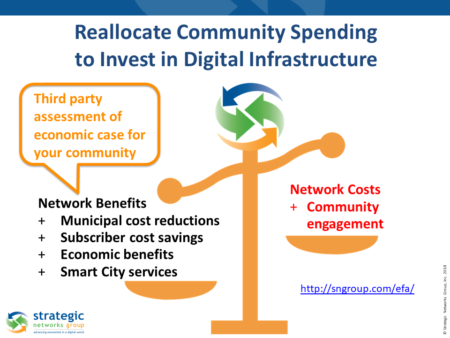 A large part of overcoming the challenges requires a paradigm shift in how you think about municipal broadband. This last concept is a key paradigm shift that turns the traditional model on its head. You create a “win-win” by offering interested property owners the option to buy into the broadband infrastructure from the outset on favorable financial terms. This new paradigm overcomes many of the challenges faced by municipal and utility network initiatives. For an example of this paradigm at work please see how Ammon, Idaho, has implemented this approach.